Trade shows continue to be an essential part of a strong integrated marketing strategy. Yes, trade shows are great way to network and schmooze with your target audience. And yes, face-to-face contact is a prime opportunity to build your client base and foster brand recognition within your industry. We also all know your mailing list has the potential to be your company’s most valuable marketing asset. Pulling off a successful trade show can fill your sales funnel for years to come. The key to achieving all of the aforementioned goals, of course, is to stand out from your competitors in the next booth. 1. Location, location, location. You know the old joke—and it’s never more true than at a trade show. Pick the most valuable real estate your budget allows to ensure you’re not hidden away in some remote corner. If your budget doesn’t allow for a bigger booth, look for a corner or end location at the front, as near the entrance as possible. Those spots go fast, so be sure to book your booth early. Bigger booths cost extra, but prime locations are often billed at the same price as that lonely corner way in the back or the unfortunate table of flyers sandwiched between high-tech circus tents. 2. About that circus tent. Bright colors stimulate the imagination. If you’ve ever walked past a sad little table with a navy tablecloth and a flat stack of brochures as the only decoration, you know just how unappealing that is. Use your imagination and the vertical space above your booth to make magic in even a small space. 3. Win at swag. Pick something unique that everybody will hang on to. Pens are great, but they get lost, and your customers will collect two dozen. It doesn’t have to be expensive, just clever—and in line with your products, services and branding whenever possible. Pick your promotional items carefully and go for something both unusual and memorable. 4. Offer snacks. Trade shows mean a long, exhausting day, and the restaurant might seem ten miles away to a weary attendee. Snacks and drinks are a welcome respite, and will bring people in who might have walked past. Candy is popular, but a more interesting choice might be freshly popped popcorn or roasted-on-the-site nuts. Never underestimate the power of smell to draw people in. 5. Make your booth interactive. It’s the digital age, so own it. Develop an interactive app that highlights your business or host a giveaway. Encourage people to sign up for your mailing list by giving them a chance to win something awesome. 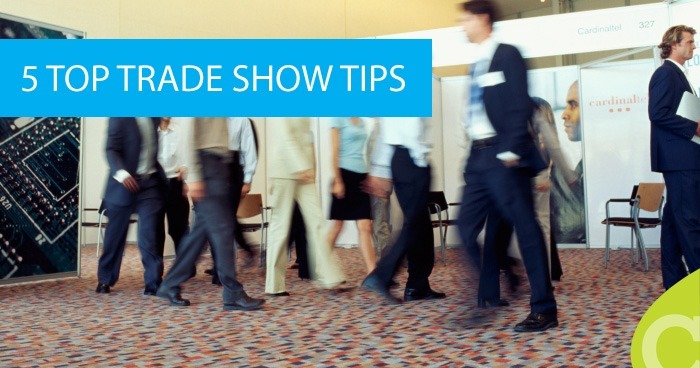 If you’re at the right trade show, it’s already packed with pre-qualified prospects. Invest in one big prize and plenty of smaller prizes to keep people interested and engaged. Announce winners using your brand new mailing list, while the show is still going on…but don’t forget to announce the winner over the loudspeaker as well, as it will bring more people to your booth. Setting up a successful trade show is a lot of work, but most marketers agree it’s worth the extra effort. Overwhelmed with the details of your next exhibition? Contact Cultivate for a trade show strategy that will ensure success and fill your sales pipeline.